The Lucrative Business Blueprint (LBB) is a comprehensive, yet simple and effective blueprint to help you create 12 different lucrative business programs based on who you are and what you know. The Lucrative Business Blueprint package includes 9 modules in an eBook covering all the details from elaborating your ideas to creating the 12 lucrative programs step by step. As well as giving you a plan to promote the business you create and establish a successful marketing strategy. What's unique about the Lucrative Business Blueprint, it give you examples of business and programs you can create. It's easy to use, just focus with an example, follow the detailed steps, and you will start selling your products immediately. 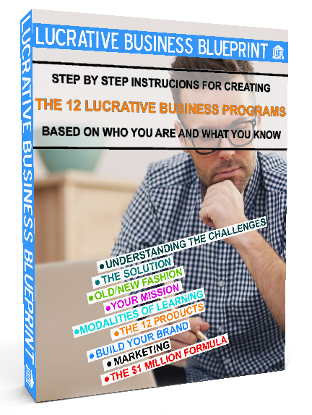 The Lucrative Business Blueprint gives you a detailed program on how to create each one of the 12 products, how to promote them using certain marketing strategies and how to turn them into a lucrative business!